This post is a convolution of David's post earlier today and Sol's from a few days ago. Our debate with Buhaug et al that Sol blogged about has dragged on for a while now, and engendered a range of press coverage, the most recent by a news reporter at Science. "A debate among scientists over climate change and conflict has turned ugly", the article begins, and goes on to catalog the complaints on either side while doing little to engage with the content. Perhaps it should be no surprise that press outlets prefer to highlight the mudslinging, but this sort of coverage is not really helpful. And what was lost in this particular coverage were the many things I think we've actually learned in the protracted debate with Buhaug. In short, one might say that you and Buhang are disagreeing on who has the burden of proof. From your perspective, you did a reasonable analysis which holds up under reasonable perturbations and you feel it should stand, unless a critic can show that any proposed alternative data inclusion or data analytic choices make a real difference. From their perspective, you did an analysis with a lot of questionable choices and it’s not worth taking your analysis seriously until all these specifics are resolved. I'm sympathetic with this summary, and am actually quite sympathetic to Buhaug and colleagues' concern about our variable selection in our original Science article. Researchers have a lot of choice over how and where to focus their analysis, which is a particular issue in our meta-analysis since there are multiple climate variables to choose from and multiple ways to operationalize them. Therefore it could be that our original effort to bring each researcher's "preferred" specification into our meta-analysis might have doubly amplified any publication bias -- with researchers of the individual studies we reviewed emphasizing the few significant results, and Sol, Ted, and I picking the most significant one out of those. Or perhaps the other researchers are not to blame and the problem could have just been with Sol, Ted, and my choices about what to focus on. Another case in point - the other day I took a call from a reporter for the Guardian who said she was working on a story about which crops are threatened by climate change. I thought I was pretty clear that when we talk about impacts we are never talking about complete eradication of the crop. But today I see their story is "8 foods you're about to lose due to climate change"! One major issue is carbon dioxide, or CO2. 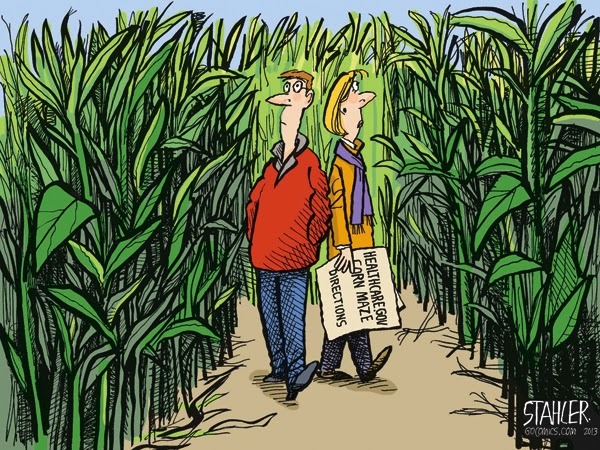 Plants use the gas to fuel photosynthesis, a fact that has led some analysts to argue that an increase CO2 is a good thing for farming. Lobell disagrees, noting that CO2 is only one of many factors in agriculture. “There’s a point at which adding more and more CO2 doesn’t help,” he says. Other factors – like the availability of water, the increasing occurrence of high and low temperature swings and the impact of stress on plant health – may outweigh the benefits of a CO2 boost. What happens over time is you learn to be a little more aggressive with reporters, but that only helps so much. And also you learn to stop answering your phone so much, and to stick with the handful of reporters you think do a really good job. It's sad but true. What's especially annoying, though, is when people see these stories and start attributing everything it says to you, as if you wrote it, picked the headline, etc. (I see some tweets today saying I'm trying to spread fear about climate change.) The irony is when I give talks or speak on panels I'm more often than not accused of being a techno-optimistic, both about climate change and food security in general. I actually am quite optimistic. About food. Just not about journalism. For many years there has been a heated debate about the empirical link between climate and conflict. A year ago, Marshall, Ted Miguel and I published a paper in Science where we reviewed existing quantitative research on this question, reanalyzed numerous studies, synthesized results into generalizable concepts, and conducted a meta-analysis of parameter estimates (watch Ted's TED talk). At the time, many researchers laid out criticism in the press and blogosphere, which Marshall fielded through G-FEED. In March, Halvard Buhaug posted a comment signed by 26 authors on his website strongly critiquing our analysis, essentially claiming that they had overturned our analysis by replicating it using an unbiased selection of studies and variables. At the time, I explained numerous errors in the comment here on G-FEED. The comment by Buhaug et al. was published today in Climatic Change as a commentary (version here), essentially unchanged from the version posted earlier with none of the errors I pointed out addressed. Abstract: A comment by Buhaug et al. attributes disagreement between our recent analyses and their review articles to biased decisions in our meta-analysis and a difference of opinion regarding statistical approaches. The claim is false. Buhaug et al.’s alteration of our meta-analysis misrepresents findings in the literature, makes statistical errors, misclassifies multiple studies, makes coding errors, and suppresses the display of results that are consistent with our original analysis. We correct these mistakes and obtain findings in line with our original results, even when we use the study selection criteria proposed by Buhaug et al. We conclude that there is no evidence in the data supporting the claims raised in Buhaug et al. Will the dry get drier, and is that the right question? A “drought” can be defined, it seems, in a million different ways. Webster’s dictionary says it’s “a period of dryness especially when prolonged; specifically: one that causes extensive damage to crops or prevents their successful growth.” Wikipedia tells me “Drought is an extended period when a region receives a deficiency in its water supply.” The urban dictionary has a different take. But nearly all definitions share the concepts of dryness and of damage or deficiency. We’ve talked a lot on this blog about drought from an agricultural perspective, and in particular how droughts in agriculture can (or at least should) often be blamed as much on high temperatures and strong evaporative demand as on low rainfall. At the same time, there’s lots of interesting work going on trying to assess drought from a hydrological perspective. Like this recent summary by Trenberth et al. The latest is a clever study by Greve et al. that tries to pin down whether and where droughts are becoming more or less common. They looked at lots of combinations of possible data sources for rainfall, evapotranspiration (ET) and potential evapotranspiration (ETp). They then chose those combinations that produced a reasonable relationship between E/P and ETp/P, defined as the Budyko curve, and used them to calculate trends in dryness for 1948-2005. The figure below shows their estimate of wet and dry areas and the different instances of wet areas getting wetter, wet getting drier, etc. The main point of their paper and media coverage was that these trends don’t follow the traditional expectation of WWDD (wet get wetter and dry get drier) – the idea that warming increases the water holding capacity of the air and thus amplifies existing patterns of rainfall. Also clear in the figure is that the biggest exception to the rule appears to be wet areas getting drier. There don’t seem to be many dry areas getting wetter over the last 50 years. The reference surface closely resembles an extensive surface of green grass of uniform height, actively growing, completely shading the ground and with adequate water." Of course, there are reasons to have a reference that is fixed in space and time – it makes it easier to compare changes in the physical environment. But if the main concern of drought is about agricultural impacts, then you have to ask yourself how much this reference really represents a modern agricultural crop. And, more generally, how relevant is the concept of a static reference in agriculture, where the crops and practices are continually changing. It’s a bit like when Dr. Evil talks about “millions of dollars” in Austin Powers. Here’s a quick example to illustrate the point for those of you still reading. 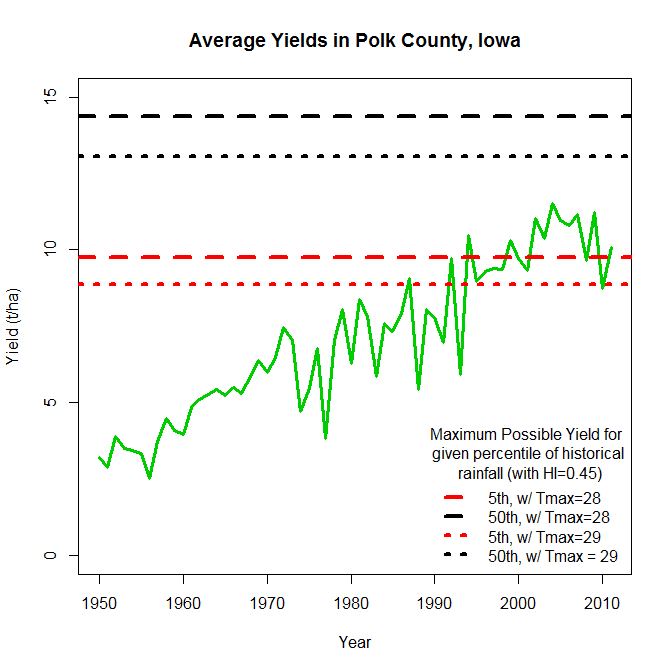 Below is a plot I made for a recent talk that shows USDA reported corn yields for a county of Iowa where we have run crop model simulations. I then use the simulations (not shown) to define the relationship between yields and water requirements. This is a fairly tight relationship since water use and total growth are closely linked, and depends mainly on average maximum temperature. The red line then shows the maximum yield that could be expected (assuming current CO2 levels ) in a dry year, defined as the 5th percentile of historical annual rainfall. Note that for recent years, this amount of rainfall is almost always deficient and will lead to large amounts of water stress. But 50 years ago the yields were much smaller, and even a dry year provided enough water for typical crop growth (assuming not too much of it was lost to other things like runoff or soil evaporation). An alternative to the PM approach is to have the reference ET defined by the potential growth of the vegetation. This was described originally, also by Penman, as a “sink strength” alternative to PM, and is tested in a nice recent paper by Tom Sinclair. It would be interesting to see the community focused on trends try to account for trends in sink strength. That way they’d be looking not just at changes in the dryness part of drought, but also the deficiency part. As someone interested in climate change, it’s nice to see continued progress on measuring trends in the physical environment. But for someone concerned about whether agriculture needs to prepare for more drought, in the sense of more water limitations to crop growth, then I think the answer in many cases is a clear yes, regardless of what’s happening to climate. As yield potential become higher and higher, the bar for what counts as "enough" water continues to rise. Update: For the record, I'm actually not against Federal crop insurance. Like Obamacare, I generally favor it. But the subsidies are surely much larger than they need to be for maximum efficiency. And I think premiums could likely be better matched to risk, and that such adjustments would be good for both taxpayers and the environment. Wow. Frumpy agricultural economics goes Politico! Actually, it's kind of strange to see a supposedly scandalous article in Politico in which you know almost every person mentioned. At issue is the federal crop insurance program. The program has been around a long time, but its scope and size--the range crops and livestock insurable under the program and the degree to which taxpayers subsidize premiums--have grown tremendously over the last 20 years. And the latest farm bill expands the program and its subsidies to grand new heights. Nearly all the agricultural economists I know regard the crop insurance program (aka Obamacare for the corn) as overly subsidized. But the issue here is not the subsides but the huge contracts received by agricultural economists moonlighting as well-paid consultants for USDA's Risk Management Agency (RMA), to help RMA design and run the insurance program. For full disclosure: I used to work for USDA in the Economic Research Service and did some research on crop insurance. Although, strangely, ties between ERS and RMA are thin to nonexistent. I've met and spoke to both Joe Glauber (USDA's Chief Economist) and Bruce Babcock (a leading professor of agricultural economics at Iowa State) a few times, and know and respect their work. And I used to work at NC State as a colleague of Barry Goodwin's. I also went to Montana State for a master's degree way back, where I took courses from Myles Watts and Joe Attwood, who are mentioned in the article. I know Vince Smith from that time too. Okay, disclosures out of the way: What's the big deal here? So ag economists work for RMA, make some nice cash, and then moonlight for the American Enterprise Institute to bash agricultural subsidies. Yeah, there are are conflicts of interest, but it would seem that there are interests on many sides and the opportunistic ag economists in question seem willing to work for all of them. They'll help RMA design crop insurance programs, but that doesn't mean they advocate for the programs or the level of subsidies farmers, insurance companies and program managers receive under them. We observe the opposite. I've got some sense of the people involved and their politics. Most of them are pretty hard-core conservative (Babcock may be an exception, not sure), and my sense is that most are unsupportive of agricultural subsidies in general. But none are going to turn down big pay check to try to make the program as efficient as possible. I don't see a scandal here. Really. Except, I do kind of wonder why all this money is going to Illinois, Texas and Montana when folks at Columbia, Hawai'i, and Stanford could, almost surely, do a much better job for a fraction of taxpayers' cost. With all due respect (and requisite academic modesty--tongue in cheek), I know these guy's work, and I'm confident folks here at G-FEED could do a much better job. I personally don't need a penny (okay, twist my arm and I'll take a month of summer salary). 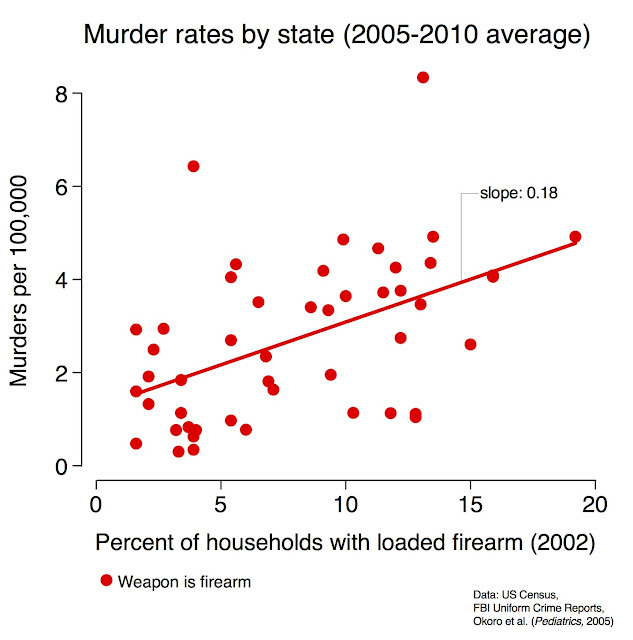 Just fund a few graduate students and let us use the data for good science. David, Wolfram, Mike + coauthors have a nice update in Science using even fancier data for the US, showing that while average corn yields have continued to increase in the US, the sensitivity of corn to high temperatures and moisture deficits has not diminished. And Max et al have a series of nice papers looking at rice in Asia, showing that hot nighttime temperatures are particularly bad for yields. The results matter a lot for our understanding of the potential impacts of climate change, suggesting that in the absence of substantial adaptation we should expect climate change to exert significant downward pressure on future growth in agricultural productivity. But we also know that for many countries of the world, agriculture makes up a small share of the economy. So if we want to say something meaningful about overall effects of climate change on the economies of these countries (and of the world as a whole), we're also going to need to know something about how non-agricultural sectors of the economy might respond to a warmer climate. Thankfully there is a growing body of research on non-agricultural effects of climate -- and there is a very nice summary of some of this research (as well as the ag research) just out in this month's Journal of Economic Literature, by heavyweights Dell, Jones, and Olken. [earlier ungated version here]. 1. Sol's 2010 PNAS paper was one of the first to look carefully at an array of non-agricultural outcomes (always ahead of the game, Sol...), using a panel of Caribbean countries from 1970-2006. Below is the money plot, showing strong negative responses of a range of non-ag sectors to temperature. Point estimate for non-ag sectors as a whole was -2.4% per +1C, which was higher than the comparable estimate for the ag sector (-0.1% per 1C). 2. Using a country-level panel, Dell Jones and Olken's instaclassic 2012 paper [ungated here] shows that both ag and non-ag output responds negatively to warmer average temperatures -- but only in poor countries. They find, for instance, that growth in industrial output in poor countries falls 2% for every 1C increase in temperature, which is only slightly lower than the -2.7% per 1C decline they find for ag. They find no effects in rich countries. 3. 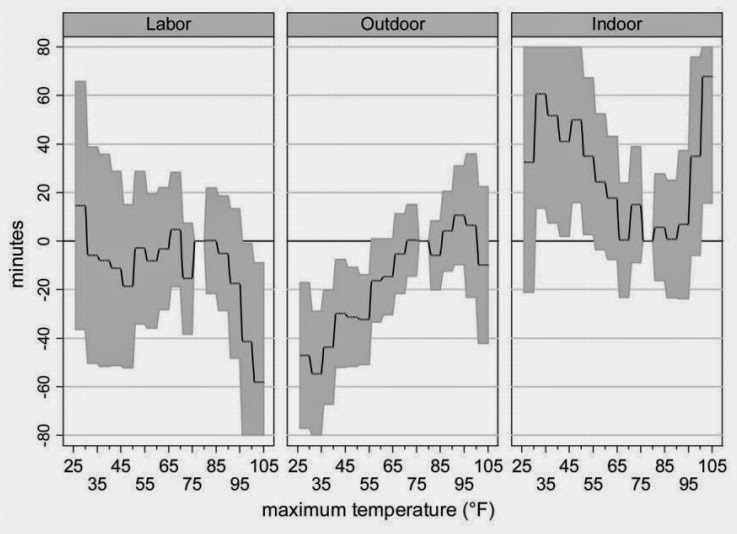 Graff Zivin and Neidell (2014) use national time use surveys in the US to show that people work a lot less on hot days. Below is their money fig: on really hot days (>90F), people in "exposed" industries (which as they define it includes everything from ag to construction to manufacturing) work almost an hour less (left panel). The right panels show leisure time. So instead of working, people sit in their air conditioning and watch TV. from Graff Zivin and Neidell 2014. Left panel is labor supply, right two panels are outdoor and indoor leisure time. 4. Cachon, Gallino, and Olivares (2012 working paper) show, somewhat surprisingly, that US car manufacturing is substantially affected by the weather. Using plant-level data from 64 plants, They show that days above 90F reduce output on that day by about 1%, and that production does not catch up in the week following a hot spell (i.e. hot days did not simply displace production). 5. Adhvaryu, Kala, and Nyshadham (2014 working paper) use very detailed production data from garment manufacturing plants to show that hotter temperatures reduce production efficiency (defined as how much a particular production line produces on a given day, relative to how much engineering estimates say they should have produced given the complexity of the garment they were producing that day). Not sure if I have the units right, but I think they find about a 0.5% decrease in production efficiency on a day that's +1C hotter. 6. Finally, in a related study, Somanathan et al (2014 working paper) use a nation-wide panel of Indian manufacturing firms and show that output decreases by 2.8% per +1C increase in annual average temperature. They show that this is almost all coming from increased exposure above 25C, again pointing to a non-linear response of output to temperature. For a subset of firms, they also collect detailed worker-level daily output data, and show that individual-level productivity suffers when temperatures are high -- but that this link is broken when plants are air conditioned. So apparently it's not just crops that do badly when it's hot. Most of the studies just mentioned cite the human physiological effects of heat stress as the likely explanation for why non-agricultural output also falls with increased heat exposure, and this seems both intuitive and plausible -- particularly given how similar the effect sizes are across these different settings. But what we don't yet know is how these mostly micro-level results might aggregate up to the macro level. 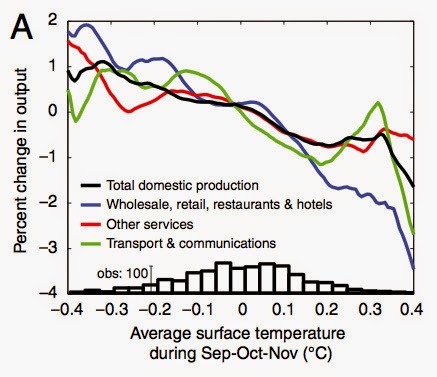 Do they matter for the projected overall effect of climate change on economies? This is something Sol and I have been working on and hope to be able to share results on soon. In the meantime, I will be setting my thermostat to 68F.